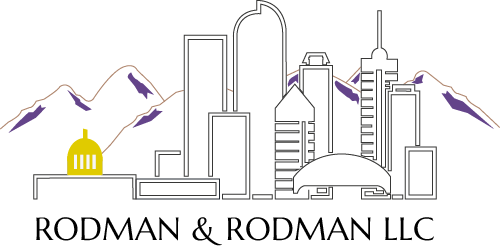 About Us | Rodman & Rodman, LLC. Rodman & Rodman, LLC. is a civil litigation firm of trial attorneys specializing in the representation of insurance companies and insured individuals on behalf of insurance companies. The firm specializes in aggressive, quality, client based legal representation in cases throughout the Denver Metro area including all the metropolitan counties, and the Eastern Plains and the Western Slope. Our representation of insurance clients involves all aspects of litigation, arbitration, mediation, trials and appeals. We also regularly argue appellate issues before the Colorado Court of Appeals and the Colorado Supreme Court. The firm believes in practicing law the old fashioned way – through long hours of hard work and a dedication to detail. We pride ourselves on not only obtaining the best results for our clients, but doing so in a timely and effectively manner. The founder, John R. Rodman, is entering his 40th year of practice, which has almost been exclusively devoted to defending insurance companies and their insureds. Mr. Rodman has tried over 200 civil jury trials to conclusion. Mr. Rodman is an AV rated lawyer, an elected “Super Lawyer”, and since 1990 has been a member of the American Board of Trial Advocates. Mr. Rodman in a National Foundation Member of ABOTA who has served as the New Member Chair and is currently the Treasurer. John R. Rodman and Brendan P. Rodman have more than 55 combined years of experience. We welcome your inquiries, comments, and questions.